John's love of the outdoors began like so many others: his father introduced him at a very young age. 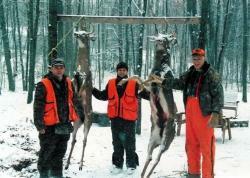 Deer camp in the northern lower became one of the most anticipated weeks of the year. He learned about deer behavior and things to look for on a 120 acre deer camp near Harrison, MI. With his wife of over 25 years Kim, they have continued to expose their 4 children to the pleasure of spending time in the outdoors. John can be found in the field or on the water year round, duck/ pheasant hunting with his dog Maverick including an annual trip to Iowa, or turkey hunting in the spring along with fishing the lakes and rivers of our great state. He has had success in walleye tournaments from the St. Marys River down to Lake Erie, but he loves to vertical jig walleye in the Detroit and St. Clair River. A trip to Alaska fishing salmon and halibut are one of his best memories. Of all the activities in the outdoors his true passion continues to be deer hunting. In the last 35 years he has hunted everywhere from the U.P. to the most southern counties of the Lower Peninsula. John has worked in the automotive industry for over 25 years and he retired from the Lapeer City Fire Department in 2016.